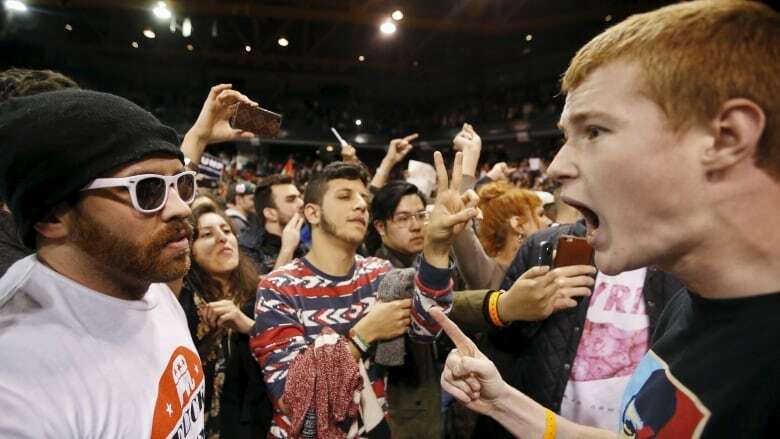 It's easy to dismiss the spate of violent clashes at Donald Trump rallies as the result of what's called mob mentality, but social psychologist Cliffort Stott says this "misses the point." CBCNews.ca and CBC News Network will have live coverage of today's Republican and Democratic presidential primaries in Florida, Ohio, Illinois and North Carolina, and will provide the latest results once polls start closing at 7 p.m. ET. 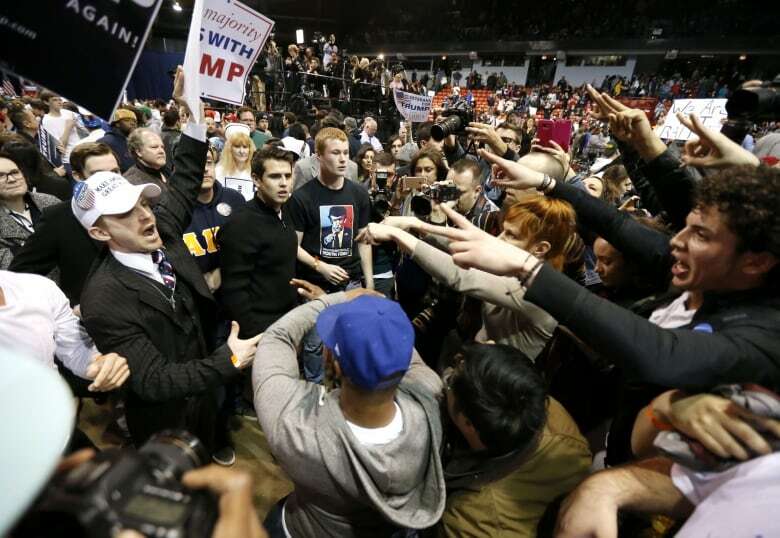 It's easy to dismiss the spate of violent clashes at Donald Trump rallies as the result of what's often called mob mentality. After all, what else would prompt seemingly normal, law-abiding people to strike and hurl threats and racial slurs at anti-Trump protesters? But social psychologist Clifford Stott says that evoking the myth of the mindless mob only serves to obscure the underlying causes of what's taking place here. Stott, a professor at Keele University in the U.K., who specializes in understanding crowds and public order policing, dislikes the term "mob mentality." "It tends to imply that people are mindless in these contexts, and what Donald Trump's doing is provoking that mindlessness. But I think that misses the point, because it's not mindless," he said. The term "assumes it as an aberration of the crowd, when actually, it's much, much worse than that. It's actually an outcome of the ideology that's come from the Trump campaign." People who engage in crowd-based violence — whether they are protesters or sports fans or presidential candidate supporters — don't lose their identity and succumb to base animal instincts, he said. Rather, they are motivated by a strong sense of "social identity." "In this kind of environment, people are acting not in terms of an individual identity," he said. "They're acting in terms of a sense of themselves as Trump supporters. And with that sense of identity, they can act collectively." Tensions between supporters and protesters at Trump rallies reached new heights over the weekend. 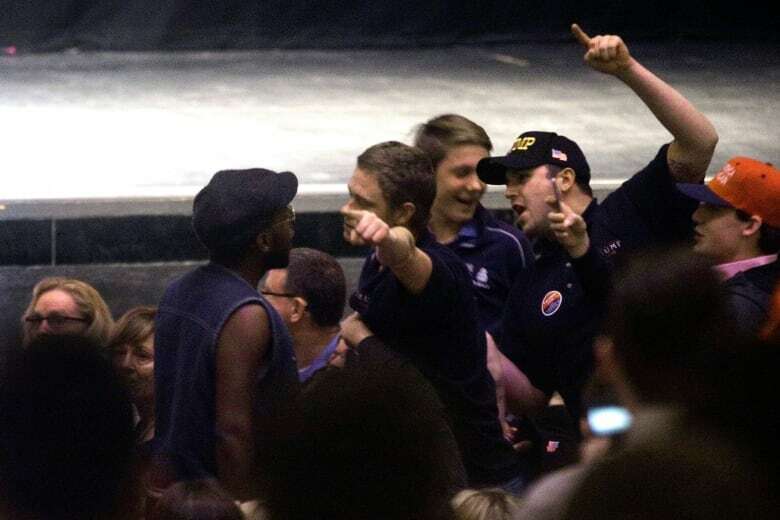 On Saturday, a protester rushed the stage at a rally outside of Dayton, Ohio, forcing Secret Service agents to leap on stage and form a protective circle around the candidate. In Cleveland, protester Brandon Krapes said he was punched repeatedly after he held up his sign, which said, "Trump: Making America Racist Again." At a rally in North Carolina, an older white Trump supporter was caught on video punching a younger black protester as police led him out of a rally. The supporter, later charged with assault, told an interviewer the next time he confronted a protester, "We might have to kill him." Meanwhile, Trump said he had instructed his people to look into paying the legal fees of the man who was arrested. Sarah Kendzior, a reporter and anthropologist who recently covered a Trump rally in St. Louis, Mo., on Friday for the Guardian newspaper, witnessed these types of clashes first hand. She told CBC News that she watched Trump supporters transform from kind, polite individuals into an angry, racist mob. Rather than be sequestered with the other media, Kendzior bought a ticket for the campaign event and stood in line, posing as a Trump supporter in order to get a fly-on-the-wall perspective. "They were absolutely ordinary people ... like the people that I see in St. Louis every day," she said. "People were kind and they were going out of their way for each other. There were people there caring for elderly relatives. There were people there caring for children." But the event was overbooked, and she found herself stuck in the plaza outside the Peabody Opera House venue with more than a thousand frustrated Trump supporters. Then came the protesters, chanting anti-Trump slogans. 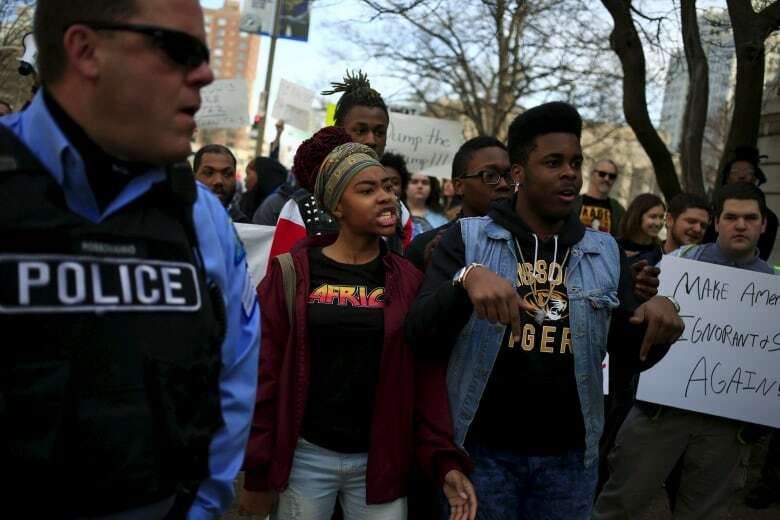 "And then the individuals in line who had been so polite and friendly just descended upon them — they were just screaming, they were getting in fist fights, they often used racial slurs," she said. Kendzior says there were probably a lot of factors at play that caused the violence to erupt — frustration at being barred from the event, rampant unemployment on both sides, and deep racial tensions still brewing from the Black Lives Matter protests that rocked the state not so long ago. The protesters, she noted, were racially diverse. She'd seen many of them before when she covered the protests in Ferguson, Mo., over a police shooting there of an unarmed black man. The Trump supporters, on the other hand, were mostly white and supportive of the police. "Things got vicious and violent very quickly," she said. From his perspective, Stott acknowledges that people do things in a crowd they would never dream of doing on their own. It comes down to two factors, he says — legitimacy and power. Legitimacy means the people around you fuel the sense that what you're doing is acceptable, while power means having the might of the crowd at your back. "Together, that sense of unity is deeply empowering for people," he says. "They feel like they're surrounded by others who give them active support. "So you get that sense that it's legitimate to assault other people and also that sense that it's possible to do it, because I'm surrounded by other people like me." But the crowd is also given power and legitimacy by their leader, he said. Both Stott and Kendzior say Trump's anti-protester rhetoric and offers to the pay the legal fees of attackers only fuels the flames. "When you have that sense of protection, that you're surrounded by a crowd of like-minded people acting in a hateful way, and that you have this leader who's encouraging you to act in a hateful way, then I think that brings something out in people and makes them behave in an anti-social and violent way that you normally wouldn't in everyday life," Kendzior said.